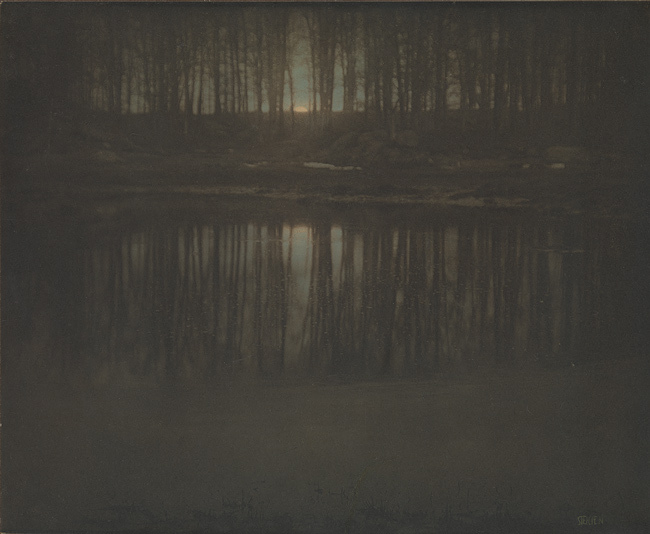 When I look at Edward Steichen’s photograph, entitled “The Pond–Moonrise,” I am looking at nature in all its glory, in all its magical splendor. The wooded scene is aglow with a sparkling enchantment, as the parts of nature gather together in harmony and joy. Through this photographic rendering, nature’s ability to make you dream, imagine, and wonder is beautifully apparent. It is as if you are alone in this forested realm, with no human presence near, with no signs of human life or interference–there is a purity to the scene, a shimmering tranquility. It is as if you are present in another time, another world, another dimension, in a painting or in a mythological work; all revealing the exquisiteness of nature. The shining moon in a colored sky blossoms over the scene, exuding a bright radiance which brings light to the environment’s spirit of growth. The hazily defined pond of elongated reflection declares that what grows above in such magnificence, grows below just the same–the trees, the life of land above…the plants, the life of water below. The fascinating photograph reveals that life is everywhere and that it is full of such enchanting beauty.